I had lots of other blog posts in my drafts folder ready to go, but this one has jumped ahead of the lot. Why? Because there's still some of this beer kicking around the UK, it isn't going to be around for long, and you've got to try it. Friends of Ham in Leeds might still have some (that's where I drank it), and I imagine the usual retailers will have some too. 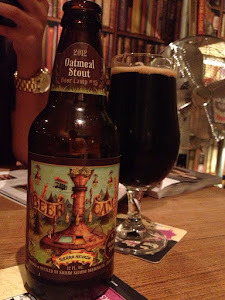 I've drank Sierra Nevada Beer Camp beers before and they've been on the whole very good, and some have been excellent. They tend to be a bit whackier than you'd expect from Sierra Nevada (who tend to make extremely drinkable, consistent, but on the whole 'safe' beers), as the recipe comes from a collection of people involved in the Beer Camp. Put enough brewers and beer geeks in a room together and I doubt a 5% pale ale will be what they come up with. So on to this Imperial Oatmeal Stout. The first thing you notice is how good this looks on the pour. Pitch black, oozy and thick with a tight mocha head and what looks to be nice low carbonation. The aroma is big fruity, sweet mocha with jabs of boozy red berry and even a little cream. Cranachan in a glass. The flavour is cherry liqueur, oats and yoghurt, slightly sour berry and fruity espresso, but also a classically thick and creamy dry stout flavour and a luscious mouthfeel from the oat. The finish is all dark chocolate and full bitterness with a peppery hop character that's almost smokey but justs stop short. This is brilliant stuff, go get some.